UPDATE: Very many thanks to all of you who have made donations so far (you know who you are) – we now have enough to cover the present FOI expenses. However, if you haven’t donated yet, please consider doing so anyway to help cover some of the ongoing costs of hosting this site (which exceed US$150 per month). We’re still waiting for that Big Oil cheque to arrive. Must have got lost in the post… Perhaps I should try and get some Big Green funding instead – that seems a great deal more bountiful. I don’t normally request donations, but in this case I am making an exception, so I hope you will forgive me in advance. Firstly a bit of background. Since my ANU Freedom of Information request was covered by The Australian (see here for full details), I have submitted a further request to The University of Melbourne (or the “Parkville Asylum” as it is known). The request is again relating to death threat emails, this time in respect of Prof David Karoly and one of his colleagues. Prof Karoly is a Review Editor for the IPCC’s Assessment Report 5 (see here – large PDF) and also on the science advisory panel for the WWF’s Climate Witness project. Apparently, being closely involved with an environmental activist organisation like the WWF does not present Karoly with any conflict of interest, whereas clearly any “denier” who earns one cent from a sceptic think tank is hopelessly compromised. Double standards are a wonderful thing. More broadly, however, [Karoly] notes an organised distribution of emails against mainstream climate change scientists. He points to “so-called think tanks” established by climate change sceptics, whose claims are cited widely by conservative industry lobby groups in a bid to convince legislators that climate change science is full of unknowns. The journalist didn’t ask him about the WWF, sadly, and Karoly clearly has no awareness of the issues that climate science faces with regard to its credibility, given Climategate and the duff predictions of people like Tim Flannery (the Climate Commissioner). Unfortunately, it seems climate scientists love to play the role of victim. The death threats story was perfect, as it allowed them to portray themselves as innocent bystanders targeted by evil “deniers” in the pay of big oil. And they can’t stop doing it. You may recall the Gergis et al paper, which was withdrawn after blogger Steve McIntyre found flaws in its calculations? Karoly politely wrote to McIntyre about the issue, but once the dust had settled, was back in his old ad hom ways, accusing McIntyre in a book review of “promulgating misinformation” (the original review by Karoly has been removed, but the Google cache still shows it, and I have preserved it in PDF here). In Australia, I have just received a threat of legal action from Steve McIntyre in Canada and am currently dealing with 6 different FOI requests. There was no threat of legal action, just a “please explain” – but it’s so much better for The Cause if you don the mantle of victimhood and claim you’re under threat of legal action. Read Steve’s post over at Climate Audit here. Also, one of those FOI requests was mine – I was going to let it drop, but seeing the manner in which Karoly has reacted to McIntyre, I’m going ahead with it. So I am therefore asking if you would be so kind as to make a donation. It is likely to be several hundred dollars, so if you are able to contribute anything (every single dollar helps) I would be personally very grateful. Please mark your donation “FoI” so that it can be allocated specifically to this project rather than towards general operating costs. Click the Donate button in the Big Oil Tip Jar in the left sidebar to send funds via PayPal. 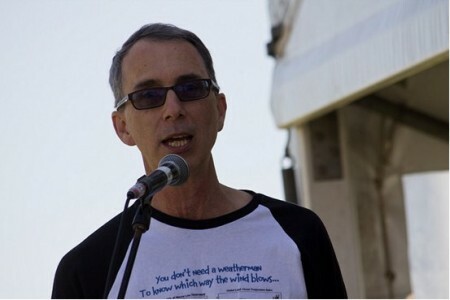 *Karoly’s t-shirt reads “You don’t need a weatherman to know which way the wind blows” – the slogan of the radical Left “Weather Underground” movement – see here. Again, it’s perfectly fine for Karoly to be an activist! Congratulations on chasing Karoly on this issue. Karoly has made outlandish statements from time to time and is one of the most arrogant climate alarmists in academia. I have just made a donation and have cited your full article on my own blog, encouraging readers to do likewise. Keep up the excellent work, Simon. I’ve thrown a couple of groats into the hat. The War against Make Poverty Global deserves an international response. Go Get ’em, Simon. What’s a groat and is it big enough to aspire for? It is my considered opinion that David Karoly may have the letters after his name but he is no real scientist. A true scientist believes in and adheres to the scientific method, and is skeptical by nature. But listening to Karoly, you sometimes wonder if the guy actually understands that mankind knows relatively little about the highly complex subject of climate. Karoly certainly does not measure up to the heavyweights like Dr John Christy and Dr Richard Lindzen who remain true to science rather than the politics of science. I place Karoly down there with Tim Flannery who, himself, comes over as just another modern day snake-oil salesman unsuccessfully trying to flog a ‘catastrophic man-made global warming potion’. I don’t have much but tipped in a little as I think you’re doing a wonderful job Simon. I’ve also put up a comment at Jo Novas drawing attention to your request. Good luck. Have chucked in a few English Groats as well – go get the lying bugger!! Greetings from the UK where democracy went out the window with the EUSSR. Likewise … good luck with the FOI request Simon. Dropped 500 groats in the jar for the FoI, contributed out of my Carbon tax compensation. I have twice attended public lectures given by Karoly at Melbourne University (my alma mater). I am ashamed of my university for abandoning the scientific method whereby a scientific hypothesis has to disprove the Null Hypothesis viz that the sun, not CO2 and especially not human-derived CO2 is the over-riding influencer in changes to the temperature of our planet. Neither Karoly nor any of the alarmist/acitivist so-called scientists have disproved the Null Hypothesis. Karoly’s suffering from the PLOM syndrome (Poor Little Old Me) does not wash with me. Karoly’s computer models are so far off the mark in back casting that it ridiculous for anybody deciding whether his so-called research deserves more funding should give him any credence or so much as a red cent. A mere modicum of due diligence regarding the verifiability of Karoly’s research would show that all his funding ought be ceased forthwith. Simon. I admire your persistence in pursuing this issue which, in my view, is demeaning the good work of so many scientists. Once this gross and massive scam is revealed for all to see, scientists of many persuasions will have an uphill battle convincing everyday people that their work is worth supporting.